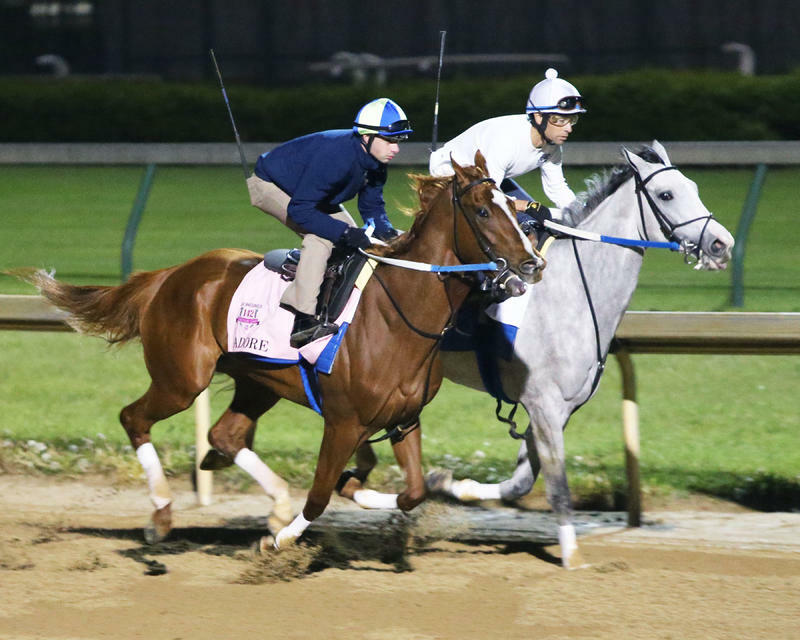 It was a busy Monday for trainer Steve Asmussen, who sent a pair of Kentucky Derby hopes to the Churchill Downs track for Monday works and new fewer than five Longines Kentucky Oaks candidates were on the Churchill Downs racing surface for important breezes. Breezing Monday for Asmussen were Terra Promessa and Taxable, who worked in-company in 1:02.80; Royal Obsession and Nickname, who breezed five furlongs in-company in 1:00; (1:00) and Adore, who worked with stablemate Tapless in 1:01.40..
"They are five very different fillies,” Asmussen said. “Terra Promessa and Taxable are very good company for each other as they had proved so in the [April 9] Fantasy (GIII) at Oaklawn Park]. I thought that they both ran very hard in their last race and did not want much from them. I thought that they handled really well, they were both very relaxed and traveled good, galloped out nice. Nickname and Royal Obsession both needed a little more this morning; they’re both bigger fillies and they’re both very talented. Adore is a very willing workhorse, a very good traveler and always on the bridle in the morning. I think with Songbird (being out) it opens the race to a new favorite so you’re just trying to imagine where everyone will be and that’s a bit of a guess.”On the outside looking in, Adore sits at No. 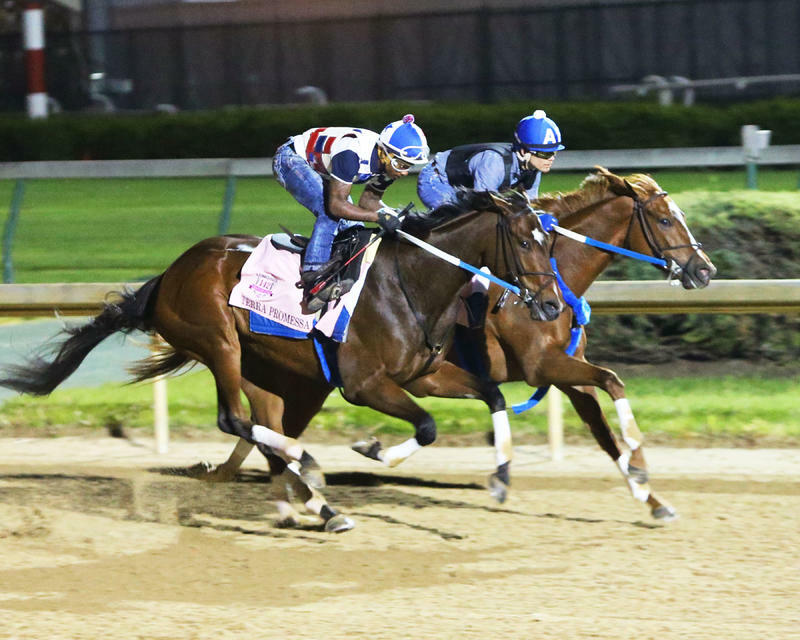 20 on the Kentucky Oaks Leaderboard with 20 points“I think that we will evaluate her work today with the connections and how we come out of it, and if not allowed to run in the Oaks, we will come up with a plan that is suitable,” Asmussen said. CARINA MIA – Three Chimneys Farm’s Carina Mia, winner of the Golden Rod (GII) here last fall and 17th on the Kentucky Oaks leaderboard, worked five furlongs in :58.80 in company after the renovation break. With Penny Gardiner up and working company with Black Eagle, a 4-year-old maiden, Carina Mia posted fractions of :11.80, :34.40, :58.80 and out six furlongs in 1:13. The move was the fastest of 34 at the distance. “She worked very well,” trainer Bill Mott said of the breeze that involved going around Kentucky Derby hopeful Lani who was galloping near the rail around the three-eighths pole. DREAM DANCE – Stoneway Farm’s Dream Dance, 12th on the Kentucky Oaks leaderboard, galloped before the renovation break under exercise rider Joel Dominguez. “She will have go a two-minute lick tomorrow and she’ll breeze Saturday,” trainer Neil Howard said. Brian Hernandez Jr. has the mount for the Oaks. GP MAGGIE GO – Mike Tarp’s Go Maggie Go, winner of the Gulfstream Park Oaks (GII) in her most recent start, walked the shedrow at trainer Dale Romans’ barn. 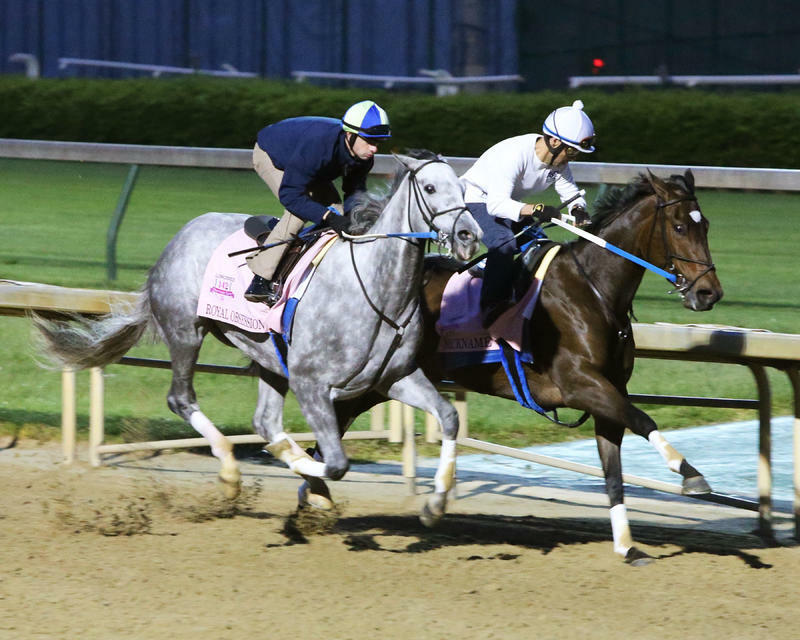 Go Maggie Go, fifth on the Kentucky Oaks leaderboard, had worked five furlongs in 1:00.80 on Saturday. LEWIS BAY – Alpha Delta Stables’ Lewis Bay, winner of the Gazelle (GII) in her most recent start and second on the Kentucky Oaks leaderboard, jogged at 6:45 with exercise rider Gian Cueva aboard. Trained by Chad Brown, Lewis Bay had worked a half-mile here in :50.20 on Saturday. MO D’AMOUR/RACHEL’S VALENTINA – Trainer Todd Pletcher’s two Kentucky Oaks hopefuls arrived at Churchill Downs Monday morning. king of Prussia Stable’s Mo d’Amour, seventh on the Kentucky Oaks leaderboard, arrived early Monday morning from Belmont Park along with Repole Stable’s Outwork. Stonestreet Stables’ Rachel’s Valentina arrived at Churchill Downs shortly after noon from Keeneland where she had been training since a runner-up finish in the Central Bank Ashland Stakes (GI). NORTHWEST TALE – Trainer Dallas Stewart said that Charles Fipke’s Northwest Tale, who was 21st on the Kentucky Oaks leaderboard, was no longer under consideration for the race. PAOLA QUEEN – Grupo 7C Racing Stable’s Paola Queen galloped before the renovation break with exercise rider J.J. Delgado aboard. Trained by Gustavo Delgado (no relation), Paola Queen stands 15th on the Kentucky Oaks leaderboard. She arrived here Friday following a five-furlong work last Wednesday at Gulfstream Park West in 1:02. Runner-up in the Gulfstream Park Oaks in her most recent start, Paola Queen is scheduled to work Friday. No rider has been confirmed for Paola Queen, who needs one defection from the prospective Oaks field to make the 14-horse starting gate. VENUS VALENTINE – Rosemont Farm’s Venus Valentine galloped after the renovation break with Maurice Sanchez aboard. Eighth on the Kentucky Oaks leaderboard, Venus Valentine will be ridden by Shaun Bridgmohan in the Oaks. Venus Valentine is scheduled to work Wednesday or Thursday depending on the weather according to trainer Tom Amoss. WEEP NO MORE – Ashbrook Farm’s Weep No More, fourth on the Kentucky Oaks leaderboard, jogged after the renovation break. It was her first day back on the track after a half-mile work in :49.20 on Saturday. Jack Bohannan, assistant to trainer Rusty Arnold, said the filly would work Sunday. Corey Lanerie has the mount in the Oaks. YOUTUBE LINK TO CHURCHILL DOWNS WORKOUT VIDEOS: https://www.youtube.com/playlist?list=PLl40UP8fX1C5CELhqkouYIGbftC230-oh.